For those that don’t remember reading Ernest Hemingway’s The Sun Also Rises in high school literature class, the novel is about a veteran of World War I (Jake) traveling to Spain with his friends to watch the bullfighting that takes place every year. His travel companions include the woman he loves (Brett), a friend he is in silent competition with (Cohn), and a few others. At the end of the novel, the entire group splits up after a fight between Jake and Cohn over Brett. But the final title of the book was not the first title that Hemingway considered. At first, it was Fiesta—a name that gives away the location behind the book with (what I’m assuming is) some sarcastic flair. You can’t have a good party without a fistfight, right? Then it became The Lost Generation—a nod to a term Gertrude Stein coined when speaking of the post-World War I generation. But Hemingway didn’t stick with that title for publication. One generation passeth away, and another generation cometh; but the earth abideth forever . . . The sun also ariseth, and the sun goeth down, and hasteth to the place where he arose . . . While I won’t disagree that the title’s origin can be found in Ecclesiastes, I think Hemingway was also giving away a bit of underlying information to the reader. In the novel, the group travels to Spain separately, but readers follow Jake’s path from Paris to Spain. The journey is primarily made by train, where Jake bumps into some Catholic students who are visiting Europe to make a pilgrimage to Rome—a small detail that doesn’t have any clear implications to the plot. But what Hemingway doesn’t make clear is that Jake is following the path of another old Catholic pilgrimage—the pilgrimage to Santiago de Compostela (aka the Way of St. James). The trip that Jake makes follows the path from Paris to Pamplona, which covers more than half of the pilgrimage. For most writers (including myself), one of the hardest things to decide is what to name the characters. Even more so for the main character, because that person is usually the on-page representation of the author. So Hemingway carefully names his character Jacob, which is the Latin version of the English name James (and the Spanish name Tiago). Hemingway named his main character after the journey he is making. When most people make the pilgrimage that Jake is on, they don’t travel by train; they travel by foot. This can be difficult, especially back when there were no maps. So, to let people know they were on the right path, land markers with seashells were placed along the route. It can be explained that since the pilgrimage ends in Santiago de Compostela, the seashell represents the Spanish coast that resides just miles from the destination. But that’s not all. The seashells are a reminder about the sun. The pilgrimage is a journey from the east to the west. All of the hope and joy and expectation that comes with a rising sun is constantly at the backs of pilgrims. Instead, day after day, they watch the setting sun as they continue westward. And while the sun sets to close another day, the pilgrim’s journey is still not complete. And if a rising sun is a sign of happiness and rejuvenation, then the setting sun is a sign of sadness and exhaustion. But the seashell—with the line at the bottom marking the horizon and the lines upward and outward in a circle representing the sun shining—is a reminder that the sun also rises. Days come and go in life. Some days we are up early, excited for what is new and exciting. Some days (or weeks or months or years) we are on a seemingly fruitless journey. All we can see is the sun setting, mocking us for our difficulties or our apparent stagnation. And it’s in those times that we need a seashell along our path to remind us…The sun also rises. I imagine that if I lived fifty years ago, I’d be the sort of person who would read the newspaper every morning before work. But in today’s world, I get most of my news from online articles—some that can be found in newspapers and some that cannot. My issue has been recalling where I read a specific article or details about a topic. I can google the article, but I only remember certain details, not where the article was published or what the title was. So, starting January 1, I decided I would catalog every online article I read. First, I made a Readability account. Readability allows people to save online articles to be read later. It has a Firefox extension, a Chrome extension, and an iOS app, which allows me to add an article no matter where I read it. And with that, all of the articles I read and tag as a favorite in Readability will be added to a spreadsheet. I now have a catalog for all of the articles I read. Now I’m finding any reason to read more articles so I can add them to the list. It’s not a bad problem to have. The start of June has always been the identifier of summer for me, even though the season doesn’t technically start until June 21. But Memorial Day feels like the end of spring for me, and—after recently returning from a trip to Myrtle Beach (see the picture on the right)—it feels like summer. So now that summer is here, I’ve made some decisions about things I want to do over the summer months. Some of those things involve reading, some involve writing, and some involve enjoying life as much as I can. The Ender Quintet — I read Ender’s Game and part of Speaker for the Dead in Myrtle Beach and I’m hooked. The Icharus Deception — Because Seth Godin. I’ve hit a good amount of my writing goals so far this year, but I’ve had two new ideas. If I get reading and writing in this summer, then you can bet I’ll be full of joy. But that’s not all I plan on doing this summer. I also plan walking all over downtown Chicago with Erin, cooking out with friends, watching fireworks, etc. This summer is going to fun, and I’m so glad it’s here! I received Lessons Learned: Leading by Example from my reddit Secret Santa. It was a perfect gift because I’ve often been told I lead by example, and I was excited to understanding what that meant for others. The book itself is a collection of short essays (usually six pages or less) from people with important titles like CEO or managing director, so it’s got practical business learnings from people who were lived the experience rather than a textbook that usually mentions examples of leadership as it looks from outside of a major company. One example is Howard Lester of Williams-Sonoma. He wrote about how, in the 1990s, his company was being pressured to spend a lot of money to make a website. Instead of following what everyone was telling him, he didn’t see the immediate benefits so he following his gut and held off. In a few years, when the .com boom went BOOM, he was glad he didn’t rush into things. Eventually Lester launched a small site for wedding registries. From there, more and more sites were made under the brand, and the money was well spent and the market brought a great return. The best part about this book is the Takeaways section at the end of every essay. It’s a three point summary of what can be learned from that leader’s story. Those takeaways have been a really good reference for me over the last week when I feel like I need some good advice. The new year is moving ahead, and I wanted to take some time to share what my reading and writing plans are for 2013. Below is a list of the ten books that I’m planning on reading this year. Most of them are non-fiction, which will be a challenge since I have a hard time reading books without a plot. Nonetheless, I’m going to give it my best effort, and I might end up writing about them if they’re any good. Lessons Learned: Leading by Example—This book was sent to me by my reddit Secret Santa, and it contains fourteen essays from various business and academic leaders. Altared—This books was written by a guy I met at Calvin’s Festival of Faith & Writing last year, and it’s been sitting on my bookshelf for four or five months. It’s written from the perspective of an engaged couple exploring how Christians can get caught up in preparing for marriage and lose focus on their faith. And Then There’s This—I’ve had this book for about three months now, on loan from my boss. It’s about the transfer of information in an increasingly viral world. It Worked for Me—I’ll be reading this book because the author, Colin Powell, is speaking at this year’s Global Leadership Summit (GLS). Usually GLS speakers talk about their latest book when they speak, so I’m hoping to get ahead of that curve with this one. Love Does—This books seems to be making its way through Christian circles lately, and the author, Bob Goff, is speaking at the GLS this year. Two birds, one stone. Reverse Innovation—This is another book from an upcoming GLS speaker and the last I will put on this list. Les Misérables—My mom gave me three volumes of this book for Christmas a few years ago. They were printed around 1900, so I’ll be downloading a digital copy and reading from it. Kingdom Come—This graphic novel covers the death of Superman, and I’ve owned it for three years now. It’s about time I sat down and read it. Platform—I’ve heard too much about how helpful this book can be that I can’t not read it. Yes, writers are much better at talking about writing than actually writing. Fortunately for me, I’m technically I’m talking about writing by writing, so there’s something good that’s accomplished in that, right? Alan Staph—Last year I mentioned that I’m working on a series of short stories about Alan. My goal is to have 15 stories by the end of the year with at least one of them submitted for publication. One Page Plays—I had an idea, just after Christmas, that I should write a series of plays where the entirety of the action fits on one page. They will fit into different categories (monologues, meet-cutes, relational, etc. ), and I will post them to a Tumblr on a regular basis. My goal is to write 50 plays by the end of the year, and then figure out what to do with them. NaNoWriMo—For four years, I’ve participated in National Novel Writing Month, and I haven’t completed the fifty-thousand word challenge yet. My goal is to try again. Blog—Keep updating. I try to write at least one blog post a week. My goal is to just stay consistent with it. Well, that’s it for my goals in reading and writing this year. I’ll be sure to post updates as I get through those books and writing projects. This summer is half over and I’m—as always—surprised at how fast time can move. I haven’t been getting as much writing out as I would like, but I have started reading J.R.R. Tolkien’s The Hobbit for the first time. This shouldn’t be a surprise since I spent much of my youth avoiding books in general, especially books that people told me I would love. Shudder. 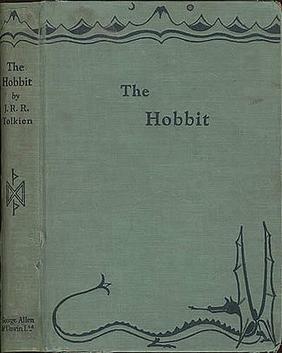 As I read The Hobbit, I’ve come to realize how much of an influence this man has had on modern literature (and culture). This goes far beyond Peter Jackson’s filmography. I mean, anytime you think of Elijah Wood or see someone with extra hairy feet, you immediately think something out of Tonkien’s mind. But that’s a step beyond where I want to go right now. The Hobbit (published 1937) is as much a story of adventure as it is a story of a pilgrimage, and I can’t help but think of Ernest Hemingway’s The Sun Also Rises (published 1926) while I read. The main characters (Jake Barnes and Bilbo Baggins) are on journeys of self-exploration and personal growth while the experience new things with their traveling companions. And they both seem to be searching for a…for some…I don’t know what. Well, I know that Jake is in search of manliness and possibly a companion, but I’m not really sure what Bilbo is searching for. Maybe that’s the point. Maybe Bilbo is just thrust into his journey without a cause, much like how we are thrust into new experiences in life. I guess I will have to wait and see.